Senator Marco Rubio has hired a coveted former aide to Mitt Romney to oversee his political activities in the Northeast and probably in a New Hampshire campaign, signaling that he is serious about a presidential bid. There has been considerable speculation about whether Mr. Rubio, who faces re-election in 2016, will go through with a presidential campaign against his fellow Floridian Mr. Bush, who is 61. 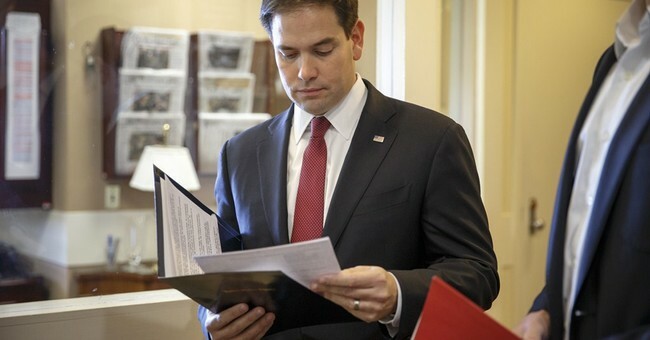 But Mr. Rubio has shown few signs of pulling back,and it is highly unlikely that an operative such as Mr. Merrill would commit this early in the primary without an assurance that his client was nearly certain to run. It isn't news to anyone Rubio's past testing the waters. But surely this is a huge "gamble" nonetheless...right? Isn't he putting his political career on the line by quixotically chasing the presidency prematurely? Shouldn't he defer to others who are more “experienced” and "qualified" -- at least for now? What if he loses the nomination and therefore his Senate seat as well? These are only some of the questions my colleagues and others have raised vis-à-vis a Rubio run. The answers to such questions, however, apparently matter very little to the candidate himself. After all, if we follow the tea leaves, it seems his most pressing ambition is to run for president.